I was recently able to try out Samsung's new budget phone that I'm positively sure they're aiming to be in competition with the LG KP500 Cookie. 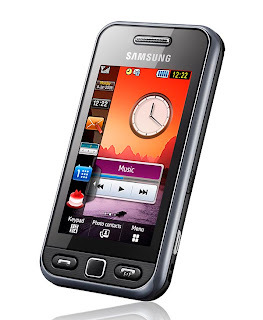 The Samsung Tocco Lite or more commonly known as the Samsung S5230 in other countries, is Samsung's cheapest budget phone. The front of the Samsung Tocco Lite reminds me of the LG KP500 Cookie while the back of the device brings to mind my Samsung Omnia. This phone has a 3 inch screen with 256k colors. There are 3 physical keys in the front and I would have really preferred a directional pad so that I can easily go back a few words in case I misspelled something while writing a text message instead of touching the display but Samsung opted to copy the annoying back button that can be found on the Tocco Ultra Touch. Like Samsung's other mobile phones, you have to remove the battery in order to insert the microSD slot. Again, as with other Samsung phones, the Samsung S5230 Tocco Lite makes use of the TouchWiz interface. The interface is very similar to the Samsung Tocco Ultra except that the Tocco Lite has a resistive touchscreen which means you have to press your fingers hard in order to get it to respond. Interface is a bit laggy though it seems faster than the LG Cookie but I can't really compare as I don't have the LG KP500 anymore to make the comparison. Although both the LG Cookie and the Samsung Tocco Lite makes use of widgets, I find Samsung's widgets more useable. What's new on the Tocco Lite mobile phone is that it can have three different homescreens which you can customize according to your liking. There's also the new contacts list that reminds you of Cover Flow where you flip through photos to dial your contact's number. Another cool feature is gesture lock which allows you to open applications while unlocking your phone just by drawing an alphabet letter on the screen. The Samsung S5230 Tocco Lite has a 3.2 megapixel camera with the usual Samsung camera phone goodies such as face detection and smile detection, unfortunately, there's no autofocus here. The camera produces clear photos especially outdoors but there's noticeable noise when taking pictures indoors. Audio quality using the headphones and Bluetooth Stereo headsets is good but unfortunately, I can't say the same when using the speakers. Audio becomes tinny when played using the highest volume setting but is okay when in the mid-level. Since this is a budget phone, the Samsung Tocco Lite doesn't have 3G or HSDPA so you just have to make do with EDGE connection. This will seem a bummer to some but it could raise the battery life of this mobile phone ten folds compared with its other brother, the S5600 which has 3G/HSDPA. Depending on the price of the Samsung Tocco Lite, the LG Cookie may have a competition. Although both mobile phones are similar in almost all hardware specifications, the addition of more camera features on the Samsung S5230 Tocco Lite might make it appeal more to other people. Of course, there's no denying that style-wise, the LG Cookie has the upper hand over the Samsung Tocco Lite. I guess it would really depend now on which feature would appeal to you most. I am thinking about getting this phone. That, or the LG Cookie. It's funny though, because on the Carphone Warehouse website, it says that it doesn't have touchscreen. However, it must have, because there aren't many buttons. Could you confirm if this phone has touchscreen or not? I'm looking for a phone with a touchscreen ya see. I don't know what's wrong with carphonewarehouse. This is the second comment I got this month informing me that their phone information is severely misguided. How can this not be a touchscreen phone?! Anyways, since I wasn't able to take any detailed pictures, try searching through YouTube for S5230 and you'll see that this is a touchscreen device. Maybe you've seen a different model? Samsung has been using the name "tocco" a lot on their products but as far a I know, all three of their Tocco phones are touchscreen capable. The S5230 is cheaper than the Cookie in my country. It's a bit slow but for that price, can't complain. I have a Tocco lite and you don't have to press your fingers hard on the screen to get a response, it's very responsive. I had a Nokia 5800 which was a lot less responsive than the Tocco lite, although it had more features. The Tocco Lite is an excellent phone. I bought this phone about a week ago its a really good phone you dont have to touch the screen hard my boyfriend has a samsung touch which is £400 8 mega pixel and my tocco lite has a few extra fetures than his well worth the money. I recently bought this phone, love the way it looks and it's features but my one seem to have a serious problem. It cuts your voice during the phone call, so the person on the end of the line can't hear half of what you say. I can still hear them, but it goes completely silent for them for a couple of seconds. This keeps happening quite a few times during all the calls I've made. I was wondering if it's just me or has anyone else experienced this problem? i have had the same problem with the people on the other side of the phonecall not being able to hear me. it is a huge problem as i have people from jobs calling me and they think i'm being ignorant, it is really annoying, i swapped my phone for another one (same model) and this does it too!!! i'm going to change it again and if the next one does the same then i'll be swapping for a different model. I have swapped the handset 3 times now and still have the same problem with it cutting and the people on the other side of the phone call not being able to hear me. I've got all 3 handsets from Carphone wharehouse so not sure if it's a batch of faulty handsets that they have or if it's something else. My sim seems to work fine on other (non-Tocco Lite) handsets so it's not a network problem. Maybe you've set the mute button while holding the phone to your ear. Try playing with the volume controls when you're talking with someone or see if the mute button wasn't accidentally pushed. I got this a couple of week ago from The Carphone Warehouse. I was originally going in to buy the LG Cookie, but the man at the desk said he wouldn't sell me it because they're rubbish. He said that only 5% of the cookies he's sold have been "good". The others have been returned to the shop. So i decided on the samsung tocco lite. I LOVE IT. It's really fun to use too. Ace phone for cheap price! I have been using this phone for 2 weeks - the best phone I have ever had. Extremly responsive touch screen (do not need a stylus), good picture quality even with shaky hands, easy to text on, easy to use, only problem is getting the back off. Ringtones and calling are extremly loud. Love it, love it love it - looks so much more expensive and stylish than the cookie! I've had three Samsung Tocco Lites in 2 days. All from Carphonewarehouse and all with the same problem. The person on the other end of the call can't hear me several times in a conversation when I am talking, although I can hear them fine. Carphonewarehouse refused to give me a refund in the shop and I had to call customer services to get this allowed. Taking the third phone back tomorrow and going back to my old phone which works fine. I am also thinking of getting this phone. Does anyones phone not cut people off on the the other end? It looks like alot of them do! hi i am looking to by the samsung tocco lite but don't know which phone to by, ethier the samsung tocco or the LG cookie. hey just bought the tocco lite todai. the best phone out. so much better than the lg cookie. okai the phone cld b better.but no complaining its still relli gd. if n e ones unsure about whether or not to buy this phone my advice is go to carphone warehouse, they let u try the phone n then if u like it u buy it. i got this phone yesterday and i think it is really good! it has brill graphics and a good quality camera. only thing it that it is a little slow when viewing images but that doesnt really matter. it does definately have a touch screen. I am Thinking about getting this phone or the LG Cookie. I want an entertainment phone as I am an entertaining person. So which one is better. Cookie or Lite ? Bought the tocco lite last week for 119.99 from the carphone warehouse.I was thinking about the lg cookie,but a lot of the reviews weren't that good.Apparently the tocco lite is newer than the cookie so a lot less teething problems hopefully.It's so easy to use.texting is good,camera is fine lots of good features.Be careful when you are taking the back off it!!! I haven't had any problems with it.Just remember to lock it after every use!!! I think it is well worth the money. I have had this phone for about a month now, I had the £10 top up put on it, and now all the money had gone. Also the CD that comes with it is not woring properly. Why not give it a shot. If it cuts of calls, you can always return it to vodafone and get a better phone like the Samsung Blade or Samsung Jet. I've had this phone a week, at first i loved it, it's a great phone which is very easy to use and the touch screen is brilliant. The only major problem I've had with this phone, has been making and receiving calls!! It cuts out and has done so on every single call that i make or receive, the person on the other side can't hear me but i can hear them. this goes on for a few seconds and it's very annoying. I'm returning mine to carphone warehouse. I've had three, all from the carphone warehouse on o2, all have had the same problem with the mic cutting out during calls. I sent it back to Samsung for repair and it came back supposedly fixed but still with the same fault. It's now too late to get a refund and all I can do is keep sending it back for repair until one day it might work. It would be a great phone if you could actually use it for calls! I am waiting for my Tocco Lite to arrive, as a replacement for a (what I thought was a broken) G600!! Whilst making and receiving calls, I was experiencing what everyone else is experiencing - calls going dead, but still being on the call????? I am on 02 network. So maybe it is the 02 network rather than out handsets? Just a thought? As like I said I had a G600 not a Tocco? I Tried This Phone Out Today !! I Love It going back to buy it later this month. I think it really is your luck with the calls cutting out ! becuase i have a samsung U600 and sometimes that happens but not all the time, and all photos on samsungs are slow to look at! Nothing is perfect in life ! Just like phones wont be! You know for what your paying for your getting a very stylish phone with good spefications! i want to get the tocco lite reli bad. it sounds like a great phone apart from problem everybody keeps having with the calls cuttin out!!!!!! My mum said she'll get me the phone......................... can't wait, jus hope she doesn't change her mind. SAMSUNG TOCCO LITE.. here i cooooooome!! The keybored is easy to use, and the camera is pretty good, i really like it and the value for money is great, it also looks great and i deffo recommended any one thinking of getting it to just go and buy it ! aparently the calls being cutting off is an error when you get the phone on o2. to solve it, make sure you get the proper o2 settings for the phone, you can do this by downloading them from somewhere on the phone. i am thinking of buying this phone on vodafone . can anyone tell me if you have had the problem of calls cutting off on this network ? please write back ! You can try visiting Vodafone's forums and asking people there if they have the Tocco Lite and if they've experienced the same problems. hiya i have this fone on orange and it works fine none of my calls have been cut off and my photos arnt that slow to look at! but my friend has the tocco lite on O2 and she has experienced the problem with the calls being cut off so i think its an O2 fault??!! i was seriously thinking about getting this phone! everyone has the same problem with there phones it cuts off calls!i dont know if i should get this phone now or not!im pretty sure it has something to do with the phone not the network my mom has had a samsung for a year now and everytime someone rings they have to call her back!so what im trying to say is,it musnt just be the tocco that has this problem!other have samsung phones have the same problems too! can anyone tell me if they have the same problem with there samsungs? I'm getting the exact same problem as everyone on here about it cutting you off! Glad i came on here because now i know loads of people having the same problem. will be taking it back to carphone warehouse. It seems the people being cut off are all on 02, and all buy from the Carphone Warehouse... I've heard this on every review site! what's going on?! I just got the tocco lite today after having the cookie for a week and hating it... the touch screen response on the cookie is soooo slow anyone thinking of getting it DONT!! anyway sold my cookie and got the tocco lite.. and its great so much faster than the cookie and looks a much nicer phone too! as for the cutting off during phone calls.. iv not experienced that yet..it seems it is just on O2 sim cards, got nothing to do with whether you get the phone from carphone warehouse or not!! I just got the tocoo lite today after having the cookie for a week and hating it.. I sold it after a week of getting it.. the touch response is sooooo slow!! However it is much more faster on the tocco lite :) I think its a great phone, anyone who cant decide when it comes to the cookie or the tocco lite.. definitely get the tocco lite.. great phone!!! This is a terrible phone, i have had the problem that everyone else is having and i've only had the phone a month. The Carphone Warehouse will not give me a refund. WARNING: save your money and buy something else. im thinking of getting this phone in about a week but im getting it on the meteor network..
hiya i thought of savin up 4 da samsung tocco lite until i found all these terrible reviews if you think wat the heck im buyin it anyway then dont get it on o2 and definately not from the carphone warehouse! i strongly advise you to test this phone before buying-if poss. and if you cant when you buy it test the calls that day and if it goes wrong GET A REFUND do not get another one with all the problems going on with this phone i strongly advise to be cautious! it's not samsungs fault because all dere other phones seem to be fine! cya! i am thinking on buying this phone and was just wondering if it came with a stylus?? do Meteor sell this fone in white? i brought the tocco lite in white on o2 from fone4u and kept getting hello?hello? new phone why could they not here me? so left it thinking must be them not me not my new £136 phone? but kept happening so tok it back within the 28days happily swapped it for another, and yep same thing started happening again only to the out of hours docter for my 1year old son, not impressed!! really needed to be heard and couldnt..so rang phones4u and will be returning it monday and will not be stupid enough to try a 3rd handset after confirming its not just me thats having problems, they shouldnt offer the phone on o2 if theres software problems allowing the phone to be used as a phone?? hi is it just the people that is getting the phones on o2 that is having the problem ? has anybody on anyother networks got a problem with there phones ?? I was having trouble wether to get the LG COOKIE or the SAMSUNG TOCCO LITE, but im sooooo glad i got this one, i think its by far better! I got it like a week ago from an Orange shop and i love it! Its takes good photos and is good for photo editing. Its really stylish, slim and easy to use. I personally havnt had any problems with the phone being cut off at the over end or whatever. Its easy to text and the touchscreen is brill! I would reccomend it to anyone wanting a stylish phone. All phones from Carphone Warehouse are unlocked and don't have any branded software from any of the mobile companies whether it be O2, T-Mobile or whoever. The problem is NOT with the phone but with the O2 Sim cards. For some reason they don't seem to work with the Tocco firmware. I have now heard of problems with O2 cards in some other phones and it all seems to be linked to the problems that O2 have been having on their network recently. The Samsung Tocco Lite phone is perfectly ok....it's just an O2 firmware problem so if you want to buy the phone then go ahead and buy it....unless you are on O2. If you are then ask them for a new SIM card with the latest firmware on it. Im really thinking about getting the Tocco Lite but some people say its a horrible phone? I really want a good stylish touchscreen phone for a reasonable price, so I was drawn to the Tocco Lite, but I don't want it if I'm going to have problems. im going to be getting this phone next wensday for my birthday.. I think that this phone looks great, with the picture quality being 3.2MP and having a 50MB memory it also sounds great! I'd really like it as my new phone, and I have started getting excited as my parents and I are deciding if I should get it for my birthday :D.
i bought mine from carphone warehouse. i was told all tocco lites are open 2 any network it's just the sim that belongs to the network. i'm on t mobile but i bought it on vodaphone cause it was £30 cheaper. then i put my t mobile sim it works fine. my advice is buy online at carphone on vodaphone. need advice on this .. I got dis fone a week ago and I absolutely love it. I know some people have had trouble with da calls and it cuttin off but I tink it is just a faulty batch from carphone warehouse. If u cant figure out which fone 2 buy between cookie and tocco lite, I recamend u get da tocco. It is rly responsive and has great picture and good sound and txt and is just an all round great fone. Hi Amyyyyyyyy. As what the others have said, most are having problems with phones coming from carphone warehouse and O2 sim. The phone itself doesn't seem to have any problems with other networks so maybe you should try getting one on another network. Just a precaution since it seems the problems have been isolated only on the O2 network. i am looking at getting a new phone and i am interested in the tocco lite but i am concerned about the calls cutting out as i would need to get it on o2 id there anyone who has got this phone on o2 and not had any cut off problems with calls? Could th prob's with o2 be the fact most o2 sim's r 3g but its a 2g phone? i'm gettin this phone on o2 tomorrow. hopefully i wont have prob's with it coz its a replacement 4 the se t700 which i had 3 replacement handsets and gave up. But I MITE HAVE TO SAVE UP! if thats the case then i will have the money in 1 month. I mite wait until my birthday in october , but i havent got a phone at the moment. Tommorrow my GCSE French results come out, so if i get a good grade my mum will buy it for me as a reward!! people have been having problems with people on the other end of the call not being able 2 hear u, these problems r only on the ones from the carphone warhouse. i got mine from dial-a-phone(online)and i hav NO problems with it! its a lot better than the lg cookie! buy this phone!!! I am thinking of getting this phone rather soon, and i was wondering if it would be worth while? also it would have to be on pay as you go, and i have seen a deal on 'phones4u' website saying it is £78 with orange. does anyone know if i get it from the phone4u shop or website, would i still get the same deals i would get if i got it from the orange shop or website? eg: orange wednesdays,dolphin package,and especailly free facebook,bebo etc. Reply to Anonymous Aug 27: I have seen this phone on dial-a-phone (there are some good deals at the moment) but did you buy yours on O2??? I'd be very interested to know this as i've had a few faulty ones from carphone warehouse and i really dont want to go through that again. i've had to go back to my 3 yr old well used phone :( and there aren't any others that are similar in spec and price. i think i'm going to get the tocco lite - all your comments have really helped me make up my mind! i just won't get it on O2... thanks all!!! iyaa every one! im thinkin about saving up 4 this phone on vodaphone.. from the vodaphone shop. but tbh i reali cant decide weather to get a LG viewty instead? im spoilt for choice haha. anyways i wrote on facebook to see weather samsung tocco lite or LG viewty was better & everyone said samsung tocco lite! i cant wait to get this phone, but i hope i dont have any problems with it. im thinkin about getting a stylus for it, but do i reali need one? or is it reali easy 2 use? oh & another thing ive heard is that they break reali easy :S is this true? Was thinking about getting this phone, haven't yet. On a lot of other reviews it mentions the same problem with calls, bought from carphone warehouse and on o2. Maybe people should buy from somewhere else?? Even if it costs a little more, surely it's worth it?? yeah, mine cuts out too. Thought I was going mad!Can't call peaple back if it's an 'unknown' call. Very annoying. I'm not with O2 and didn't get mine from the carphonewarehouse. Is it repairable? love the touchscreen & everything that comes with it. just cant seem to get the back off.. any help? What i have heard from ALOT of people it only cuts off with o2 from the CARPHONE WAREHOUSE Today i'm getting in on meteor but could anyone tell me if you need to charge it up first ?? ive read a tonne of reviews for this phone, it seems like the 'cutting off' seems so be a very large issue. Mostly if the phone is from O2 or bought from the carphone warehouse. I'm going to look for a better phone with better reviews before i make my choice. Just get a web bolt on or something. I have o2 simplicity which is basically pay and go only it comes out of my bank by direct debit each month. For £20/month, I get 1000 texts & 600mins to any network, plus unlimted web usage. This means I can sign onto msn, and stay signed onto it constantly, I can use google maps, youtube, email, bebo etc etc as much as I like. All this included for £20 is fantastic. do you get a screen cover when you buy it to stop it scratching when its in your pocket??? I have a LG Cookie, after a few weeks, about 3 or soo, the sound stopped working, if would play music but no sound, also if someone called you there was no sound as well. It is my birthday and christmas coming up and i am very interested in the tocco lite pink, it seems nearly the same but if you pay just a little more you get a better camera and a reliable brand. Hi defo want this phone as a replacement for a broken sony ericsson w595. i have a contract on 3. the only place i think you can get it unlocked is carphone warehouse? Does it break if you get it from there and how much is it to get it with no sim and unlocked? i was thinking about getting the tocco lite on virgin but the website said that it didnt have any games on it, does anyone have it on virgin? if so does it have any games on there? also does it have a flash coz i heard that it did but again the website said it didnt. gettin the tocco lite on t-mobile nd has any1 had problems with it on that network? i love the phone!! but on a tesco tariff would it cut calls of ??? The answer to most of your questions would be: Not all calls will get cut off it has nothing to do with Samsung's handset being faulty. It's the 02 network. So if you are on 02 and are planning to buy this, get it with a sim also, but on a different network. as with previous comments im also having the same prob , i bought from carphone warehouse and im on o2 which seems to be the prob, i was told on another site to try going into MENU then APPLICATIONS then O2 then GET SETTINGS and see if that worked? worth a try?? other than that the phone is excellent but admittedly very VERY annoyed about this problem! I was thinking of buying this phone in white, on vodafone network am i doing the right thing? Is the mp3 player good on the taco lite coz i lost my ipod nd i want to use the phone as an ipod aswell.Does it hold much songs? I jut got this phone and to tell you the truth i felt bummbed! i already had a cookie but tocco still beats the cookie. Bradley, it does have a memory card slot. You have to open up the back and its behind the battery. Hi im buying this fone 2moz, but was wondering does it have a headfone port?? hello everyone i am thinking about getting a tocco lite but after being on this website i am sooooo confused!! everyone keeps saying that it is a rubbish phone so i am asking for tips about where to get it from what network etc.. RIGHT lets get this sorted everyone has heard about and is moaning about the o2/samsung screw-up with the software on the sim this is all it is!! GET ANOTHER SIM FROM O2 !!! The Tocco Lite is an amazing phone for the petty price of £82 with discount which you can only get from o2 btw, (( they give you the average you have toped up by over the last three months as discount)). Screen is easy to use although yes, it can need a bit of firmness from time to time, SO WHAT? FABULOUS PHONES..... And yes it does deff have a touch screen any idiot can see that! And NO it does not have a stylus pen! This phone isnt that good. The phone has a really light metallic colour. The batterie life isnt really good. The screensavers aint that nice. There is a big bar. The touch sence isnt really good. When i click on music it takes me to videos. Ive gave mine back but stupid carphone warehouse didnt take it back so im stuck with the stupid phone. Its a terrible phone i vote it 1.5 stars. I think next time i will buy a LG phone or a motorola phone instead of crap samsung and i think i will buy the phone from orange they might take the phone back if they dont i guess i will move to china! Who ever said they wanted to use a stylus on it, dont. It may SCRATCH and you can see the scratch when the phone is switched on. It happened to my LG Cookie. The tocco lite is a great phone btw, very smart. It would be a shame to scratch it. i bought this phone about a week ago from carphone warehouse. i bought it on vodaphone and was already unlocked for o2. havent had any problems with it, not even with the calls. Its a really good phone! I'm gutted that I broke it at a gig :( the only bad thing is, that camera seriously needs a flash, if it has a flash, I would have rated it 5/5, but because it has no flash, its going to have to be 4/5. This Phone is a touchscreen phone i myself prefare this phone to the lg cookie i havnt had this phone or the samsung tocco lite but bothe my friends have these phones and the samsung is a much better phone althugh the lg cookie is easier to use does anyone know if this phone has a stylus for the touchscreen? The Tocco Lite comes with a stylus but it's not on the phone but a separate accessory in the box. Please someone help+tell me which is a better phone! !+does a stylus come with this phone?? I had this phone from carphone warehouse, im on an o2 pay montly sim only contract. After having this phone for a month it started doing the cutting out during calls problem and it doesnt happen when i put the vodaphone sim card in so its a firmware problem. Carphone warehouse wont do anything but constantly send it for repair its a joke. The phone itself is ok, but the vibrate on it is very weak. I tried the changing the o2 settings trick and it didnt work so looks like ive wasted £100. Avoid this phone if you are on o2. I'm getting the tocco for my birthday. I was a bit torn between the cookie and tocco but after reading all these reviews I decided to go with the tocco.I'm thinking of getting it on o2 but NOT through carphone warehouse. Will the calling glitch still be there or is it just on carphone? and finally scrolling through songs and other things is difficult but that could be because i am not yet use to it. on the plus side it is alot more stylish than the lg cookie and the quality of the camera appears to be alot better. carn't wait to get a samsung s5230 tocco lite phone for christmas !! I have got this phone, and i think it is brilliant. Whoever is guna get this phone over the LG cookie, you should get it. Because it responds more than the cookie and the cookie is really slow. My friend has got one and when she goes to read a message it wont let you see the message until like 15 seconds later, but with the tocco lite, it will come up straight away. All this is my point of veiw but honestly it's a brilliant phone with all the applications and the widgets. i have tocco lite on orange. cant get the ans phone symbol to dissapear. have no new messages on it.has any one else had the same prob or know how to get rid of it? I recently bought the tacco lite and was using it on 02. The calls were 'cutting out'. The problem is not the phone it is the 02 network. You have to change the 'network' settings and the problem will be solved. Since doing this the phone works fine. I've had my LG KS360 for the past year and recently its completely messed up; unfortunately because of o2s 1 year warranty they won't refund.Easy to use and was good while it lasted, as far as i've seen not as good as the Tocco although it depends on whether you want a Qwerty keypad or touchscreen. For both I'd advise buying a cover or some sort of water protection for the KS360. Is the Tocco still having issues with cut out? Even with using a new SIM card or just with old ones? Or is it to do with o2 not the SIM? i am getting this phone for christmas but i'm worried thr bluetooth won't work. Tocco related offers plus accessories reviewed and best buys! i was stuck between the tocco lite and the cookie, but now im getting the tocco lite =D. I have had this phone for just over a week, it is a nice looking phone and easy to use but it has some bugs in the software which cause lock up and cant do anything until the battery has been removed. #1. If the camera is set to video and the camera button is pressed it locks up. #2. If the alarm clock goes off and you press some strange button sequence (dont know what was half asleep at the time) it locks up. #3. The unlock gesture doesnt always work, I have it set to "E" most of the time it works, but after phone has been locked for > 24 hours it says unrecognized character. You have to press the unlock button to unlock then it all works again. #4. When in a call and wanting the keypad on screen to dial extra numbers i.e. for telephone bank, the keypad does not always appear, sometimes have to end the call and redial to get it to work. My smasung software NPS update says its version 1.1.2 ID3 and if I do an update device, it says device not supported. Had my tocco lite for about a week now. Best phone ive ever had, easy to use and some great features. Did have trouble getting key pad on screen so i could use my voice mail etc. Totally my fault press and hold lock button on side of phone and all becomes clear. All in all great phone. just got this phone i loved it but i had to charge it i charged it for 12 hours then i was putting contacts in and it just turned off and wont turn back on ? I am on the brink of buying the tocco light and I was going to get it on O2 but I have heard that it goes dodgy and cuts it off. What other network would anyone reccommend. I live in North Yorkshire. I've just got the tocco lite for christmas but whenever i try signing into anything on the internet such as hotmail it just refreshes the login page and wont let me sign in. I took it to the o2 shop and they took the over 18 lock off it but that did not solve the problem, i've also rang o2 and they said they could not help as i am on pay as you go but they sent me settings again...it still doesn't work!! Does anyone know what to do to make it work? I'd be really grateful for some help lol, cheers! @ last ANONYMOUS: Try downloading Opera mini by going to mini.opera.com on your browser. You not being able to sign in might be a browser issue on the Tocco's side. The Opera Mini browser should be able to handle sites like hotmail. Unless of course you're not able to go to ANY site in that case, your internet settings might be the problem. Anyone who has the problem with the cutting off during calls on O2 it was a firmware problem and I dont think any of the newer ones have the problem. After taking mine back to get repaired for the third time carephone warehouse finally upgraded the firmware and now after 6 months I can finally enjoy a phone call with no cutting off! What games can u put on the samsung tocco lite? The phone is definitly touch screen its the best phone in the world except iphone!!!! I reccomend this phone to any1 thats awesome!! Hi, I have had the tocco lite for about 3 mnths now and yes i am on 02.. but... i have never had a call cutting out on me, saying that i didnt buy it from the carphone ware house but direct from 02. The problem i have is that i have now got a bluetooth headset, when i connect the phone to it the screen just shows 'bluetooth connected' and i cant use the screen to call out or anything!! whats that all about??? has anyone else had this problem or is it just me? Also, it keeps turning off and on again, sometimes its just if i take it out of my pocket and put it on the table so its not like im dropping it?!?!? any ideas??? @Anonymous, January 8: You should take it back to where you got it from and see if they can fix it. Of course, it's not covered by the warranty so expect to pay for the costs. @Anonymous, January 9: Try search for "Java games" That should work for the Tocco Lite. Some websites are offering free java games from your mobile phones. @Anonymous, January 10: What kind of Bluetooth headset are you using? Maybe it's not compatible. this fone is a brilliant fone but its annoying it beats my old sony erricson k750i on features but that sony ericsson was quality it was brilliant this one just cant do that !!! I have just purchased a samsung s5230 from carphone warehouse, but have now changed it three times, and have had the same problem with them all. i.e the battery will only last about 10 hours switched on but being used from a full charge of 8 hrs, carphone warehouse refuse to give me a refund or the option to change to a different model, saying that I am the only one having this problem out of all the s5230 phones sold. Is there anyone else out there that is having this problem with the s5230. The battery life on my Tocco Lite is not great either, though not as bad as the last comment; I don't use the phone a great deal, maybe half an hour a day max, but it still needs charging every couple of days. Hi, I'm thinking of getting this phone but I've read all the comments about calls cutting out if you buy it on the o2 network from carphone warehouse. I was just wondering, will this happen if i buy it from an actual o2 shop? I too am thinking of buying a Tocco lite and I was browsing around to check the pros and cons then I got onto this page. I've the same problem as some others, as it cuts off or goes silent in the middle of the conversation. How do i override having to press the hold button during a call to use the keypad.? As this is a nightmare when you have a number option to press when asked. I have the same problem. When you dial an 1-800 number from address book or call log and you get a prompt to enter further numbers, you need the key pad but the key pad will not appear unless you press and hold the HOLD KEY. Then you need to press the keypad icon to get the keypad. This is an extra step and takes time and you may time out to enter the response especially if you are using the calling cards. I recently left my phone into carphonewarehouse as my touchscreen had stopped working, they replaced the screen and it's working great now. Although i now have another problem; since i have got it back i can't get any network at all. it just says failed! I have tried to get network connection from different areas and nothing works. What should i do, please help! My 9 month old Tocco Lite has started to switch off frequently, will not switch on at all now. Anyone had the same problem? Reeaally bad phone. Dont recommend. Poor touch screen. turns itself off and i have only had it 6 months! AWFUL PHONE. the only thing good about it is the battery life. I've had this phone for four months now and it is still great! I love the widgets and all the different options, and the camera is great! The touch screen is extremely responsive and it's extremely easy to type messages! I've found that the music, with earphones, is good but without earphones it can become quite tinny sounding :/ I adore the photo contacts app and the organiser is super! I love all the little apps which you get with the phone and the bluetooth is really responsive. From what I've seen, problems seem to be happening with phones bought from the carphone warehouse on O2?! so I'd stay clear of them, tesco mobile's good with the triple credit deal on pay as you go (what I'm on) The internet can be a bit slow but it is copable. The smart unlock blew me away (previously I'd had an ancient phone) and all the different call settings and security is really secure! There's even things to change if you're left or right handed for easy access! If I were you, I'd definitely get this phone; I'm not too sure of the prices now but when I got mine it was only £40 and with all the features it is definitely worth buying! at first when i got this phone 7 months ago i thought it was a good phone, it was the best phone id had, tbh it still is the best ive had compared to the other ones ive had in a way but it would restart itself when i bashed it or something, i had problems with it turning off at onepoint so i sent it off to get fixed, the problem was fixed and the phone was returned within a week. now it comes up with messages like incorrect character when i touch the screen when its locked and calls people by itself, it doesnt turn off itself anymore evenw when i dropped it on the floor in a street today it still stayed on but with the faults on the phone that i am having i reccoment you to buy something else, its not worth bothering with.